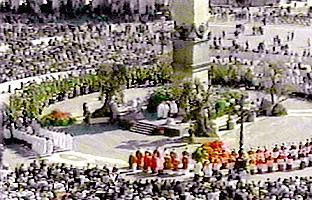 Pope Benedict XVI, flanked by Archbishop Piero Marini, celebrates Palm Sunday Mass at the foot toe the ancient Egyptian obelisk in the center of St. Peter's Square April 9, 2006. 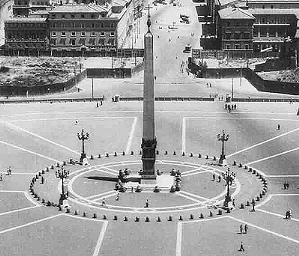 The eight spokes (or double cross) emanating from the obelisk in St. Peter's square likely represent the eight divisions of the solar calendar: solstices, equinoxes and quarter cross days. The obelisk originated in Heliopolis, Egypt, the home of the occult Hermetic tradition which St. Augustine preached against. In looking thru some of your posts/rants, I can only say that you are your own worst enemy. The rants against God's Chosen are so silly and vicious, that any fair-minded person sees right through them. There aren't any rants against God's chosen people here. There is commentary on the ideology and behaviour of the self-chosen, however. The sillyness and viciousness is in the books and traditions of the self-chosen. Any fair minded person can recognize this. The more outrageous the stunt, the more shame one should feel for questioning it. The photo ops in the pope suit with obelisk probably aren't as bad as the subito santo's photo op in his pope suit on the Mount where the Sermon on the Mount was preached. Who could forget the inverted cross hung there as a decoration by our 'elder brothers in the faith'. 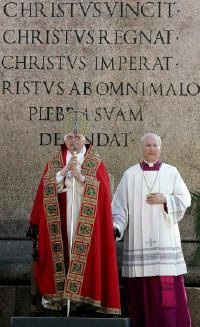 Did you mark Benedict's stole for the Feast of the Nativity 2007? All the crosses displayed a Roman gladius athwart them - and this was carried by CNN and every channel. This is probably some signal to his fellow Illuminists. Wonder what it portends.